Welcome to the two hundred and sixty-fifth of my blog interviews with novelists, poets, short story authors, biographers, agents, publishers and more. Today’s is with short story author and novelist Guy Cranswick. A list of interviewees (blogged and scheduled) can be found here. If you like what you read, please do go and investigate further. Morgen: Hello, Guy. Please tell us something about yourself and how you came to be a writer. Guy: Well that is a complex question. The easy part first: I live in Sydney and I’ve also lived in other cities, including London. As to becoming a writer, well, it seems to me that writers are a type, a personality and writing will be part of their character. Some find the craft, the voice easily, other take some time. I had times of writing and then stopping but over the last four years it has progressed and I have finished four books. Morgen: Me too – three for NaNoWriMo and another in between, although I suspect yours are more formed than mine (I’ve done some editing but not for ages so will need overhauls). What genre do you generally write? Guy: I write literary fiction. I am not much good at genre and there are layers of craft to acquire in genre fiction. I like crime or mystery genre because like literary fiction, it says something about people; why they do things and what they are driven to do when forces compel them to act. Morgen: Oh I’m rubbish at saying what genre I write. I say “dark and light” which really is no help at all. 🙂 What have you had published to-date? Do you have a favourite of your books or characters? Nine Avenues which will be published next year. I don’t have a fondness for certain characters but I like the way this one emerged in a story called Becoming where a man moves into a dilapidated house after his marriage is over and he puts a new life together through the renovation of the house. Morgen: I can relate to that (not the divorce, though in my case). If applicable, can you remember where you first saw one of your books in a bookshop or being read by a member of the public? Guy: I’ve met readers, people who have bought my books after meeting me. It’s gratifying, especially if they remark on the stories. One reader told me he wished the stories were longer, he knew they couldn’t be, but he was involved he wanted more. Morgen: I’ve had that a couple of times with my anthology Story a Day May which is great but I agree that a story has to be the length it has to be. It’s much harder to trim than pad. 🙂 What was your first acceptance and is being accepted still a thrill? Guy: My first acceptance was a few years ago and it was pleasing. I had had rejections – as every writer will have. Being accepted is very pleasing; it means someone else likes the work and wants it shared. Morgen: Exactly. On the flip side there’s rejections. Have you had many? How do you deal with them? Guy: It doesn’t bother me too much. It’d be nice to be accepted by every publisher, but the work may not be what they want, either commercially or artistically. Accept rejection and be confident in the style and qualities and look for another publisher and keep writing. Morgen: It’s just one person’s opinion. Have you won or been shortlisted in any competitions and do you think they help with a writer’s success? Guy: I have been shortlisted and won a small competition a few years ago. They are useful, artistic competitions are not the same as athletics, there is no absolute proof, but at the outset they are good to see how one is going and to perhaps write something to a theme. Morgen: Are your books available as eBooks? Do you read eBooks? Guy: Yes I have e-books and it will be a big part of the future of publishing. My novel is available at Barnes and Noble and iTunes. Guy: I try to do what I can and that is mostly online. If a shop franchise or media outlet wants me to do readings, interviews, or a tour, that is fine with me. I don’t blog or tweet because I don’t have that much time to give it and to do that well it has to be a commitment. I have quite a full a timetable. Guy: With the new collection, Nine Avenues, it is our intention to post comments and invite feedback so the site will be a blog and a contact point for this set of stories. Morgen: Ah, stories, my first (and last) love. 🙂 What are you working on at the moment / next? Guy: In September I finished a novel which is in the market now. That novel, called “The Hidden Bend”, is about three characters in different places and each one dealing with an event that changes their lives. I have plans to write a longer novel next year and it has taken shape in terms of character and theme, but I am resting, researching now as I build the necessary energy to write that one. Morgen: That’s great going to have finished it in September and have it out already, and the follow-up sounds intriguing. What is your opinion of writer’s block? Do you ever suffer from it? Guy: Luckily I have not had it. I have had times when I have stumbled but planning and thinking it through has worked for me. I tend to plan something out, not to granular detail, but know where it is going. I am sure genuine writer’s block is a worrying moment and I hope it will not touch me. Morgen: Me too. I’m very lucky; I have ideas pouring out of me… too many for the time I have to write. Do you have a method for creating your characters, their names and what do you think makes them believable? Guy: Not a formal way. I usually go with something that is intuitive. I often use two names, first and surname, to anchor characters. I think it was a technique Francois Truffaut used. But more than names the characters have to do what they must, to follow a path which a person would do just the same. They should not be plot outlines. The best characters to write are flawed, not criminal, but imperfect as real people can be. They might adore their children but cheat the waiter of a tip. Morgen: Perfect is certainly dull… we like to relate to flaws. 🙂 Do you do a lot of editing or do you find that as time goes on your writing is more fully-formed? Guy: With the last novel I was surprised that my editing was light. I had often written a first draft well short of a completed draft and found I had much to fill in. I think with planning and writing every day I came through close to how I wanted. Morgen: It’s all practice, like anything else. You mentioned research earlier, do you have to do much? Guy: I am a researcher by nature and background is important but not over done. I had a character set in an Asian county post war and I thought I might research that but stopped as I started because I realised anyone reading it would look for real connections to real Asian conflicts. So I abstracted it – it makes it more interesting for the reader – less fact – more broad strokes for the character to be shown against. Morgen: 🙂 Some writers like quiet, others the noise of a coffee shop etc., do you listen to music or have noise around you when you write or do you need silence? Guy: Quiet mostly, but as the afternoon moves on I will play music, but by then I am in a revising and review mode. Morgen: Very organised. 🙂 What point of view do you find most to your liking: first person or third person? Have you ever tried second person? Guy: That is intuitive. Some pieces seem right in first and others third. I did write a story in the Nine Avenues collection which uses three characters in each mode of speech. The story opens in the third; then another character is in the first, the final is a boy addressed in the second. Morgen: Regularly readers of these interviews will know how much I love second. 🙂 Do you have pieces of work that you think will never see light of day? Guy: Yes. Some disjecta, shorter stories and probably film scripts which are either made or remain dust collecting unproduced drafts. Guy: The favourite is the writing, the creation, the language, in making words do things. The least favourite is the tired neck and sore back. When I wrote “The Hidden Bend”, I wrote up to 2,000 words a day over three months. By the end I was nearly broken. Morgen: Wow. I’m pretty shattered after NaNoWriMo, especially after last November as I was blogging so much as well. What advice would you give aspiring writers? Guy: If you want to write, you will do it. Nothing will stop you and it’s cheap to do. Most people dislike writing, its lonely and boring but not to a writer. Making it work commercially is another thing but not being a writer all the same. Morgen: You have to have passion there’s nothing as thrilling (to me anyway) as creating a new character and helping them create their world. What do you like to read? Guy: I like to read widely and in foreign languages: history, economics, biography, technology and fiction. Just some titles from memory over the last year or so, Montalbano, the Italian detective series; the Isaacson biography of Steve Jobs; JM Keynes’s great work, The General Theory etc, much quoted and misquoted, which is a pleasure to read and has some dry wit. And French writer; Jean Giono’s, romance adventure, ‘Le hussard sur le toit”. And I return to Faulkner and Beckett at various times, even just for a few pages. Morgen: A great variety. 🙂 If you could invite three people from any era to dinner, who would you choose and what would you cook? Guy: I like to cook but the choice of people is daunting. Either choose people you want to talk to such as writers, though some would be talkative and others taciturn, or just drinkers. Or choose people who are famous for being on such dinner party lists. Well then the choice has to be Balzac, PJ Harvey and Billy Wilder, all writers but in different media. The menu would comprise (without dietary regimes) modern French cuisine. Balzac would probably refuse to eat a Thai or Indian meal. Morgen: He wouldn’t know what he was missing. 🙂 You mentioned quotes – is there a word, phrase or quote you like? Guy: There is a quote from Miles Davis, who was talking to John Coltrane. The saxophonist asked Miles Davis’s advice on how to end a solo because he couldn’t. Miles answered in his distinctive whisper, “Take the horn out your mouth.” Silence works. You don’t have to play all the time. The other side of the story is that Coltrane would not finish a solo, his ego was carrying him and Davis told him to end it, in other words, you are in control of what you do. Morgen: Absolutely… unless the characters are. 🙂 What do you think the future holds for a writer? Guy: Very good but not always easy. The opportunities electronically and ability to distribute work and connect is greater than ever. That does not mean huge success or untold wealth are waiting for all. But reaching readers and making the work stand for what it is are achievable. Morgen: I’m only on the first rung on that ladder but I love it. Where can we find out about you and your work? Guy: Short term at Nine Avenues and Google is very good indexing material. Longer term I will have to make a decision on a blog or full site. Morgen: I have both; a website (http://morgenbailey.com) but the software is terribly un-user-friendly and drives me nuts so it just points to this blog here. Thank you very much Guy. Lovely chatting with you. “And to fill in your voice, with your presence, I would say softly with barely breath passing from my mouth, I would say, If you wear that dress; then immediately I was in my best suit standing at your front step waiting for you to enter the hallway and I would hold you in my eyes as you walked towards me, unable to stop a smile and I beheld you in that dress; somehow changed as though the fabric harnessed some hidden part of yourself and now it radiated to me. There you were clearer than any photograph and moving towards me as I am now moving to you. 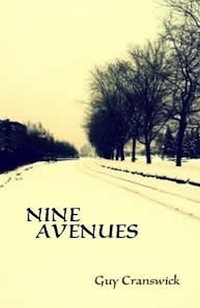 Update September 2012: My forthcoming book ‘Nine Avenues’ is out late October 2012 – the following link talks about the cover and the artist who made it: https://nineavenues.wordpress.com/2012/08/25/cover-revealed.